This kaitaka ngore once belonged to the Rongowhakaata leader Te Kooti Arikirangi Te Turuki (c1832 — 1893) who was variously known as a martyr, a rebel and a prophet during the New Zealand wars. Te Kooti was the founder of the Ringatu faith, which was based on interpretation of Old Testament text. Through this he was also the leader of a resistance movement against the colonial government. He was one of the most wanted men in the colony with a bounty of £5000 on his head until he was pardoned by a controversial act of parliament in February 1883. The kaitaka and its story represent a complex and interesting period in the history of the region and of the nation. As an artefact of Maori-colonial interaction it is a treasure of significant value. From the quality of the weaving ¡t is clear that this kaitaka was made for a person of high status as it comprises a number of weaving styles. 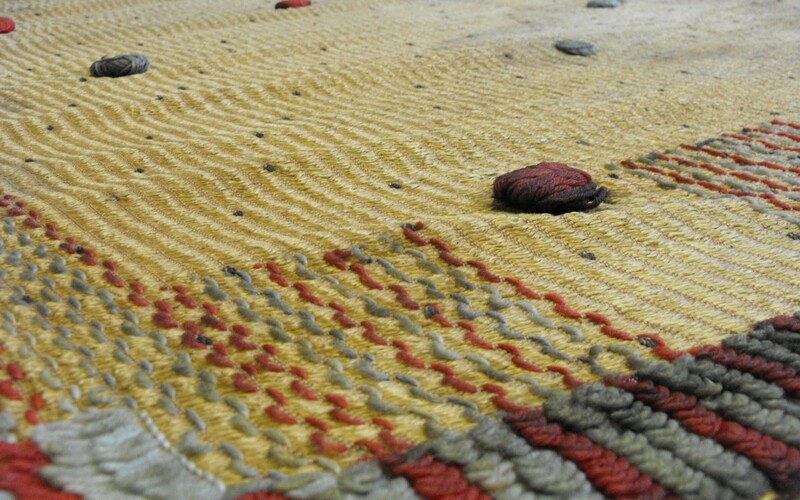 It features a bias well – or aho poka – which is a structural feature of the kaitaka, designed to give shape to the garment when worn and is decorated with thrums of black fibre tassels (huka huka) and woolen pom-poms (ngore). The story of this kaitaka was re-told by local and overseas newspapers. The donor’s great-grandmother Mrs Hutchinson and her family lived on land opposite Orakau and near the Aukati line – behind which King Tawhiao had been exiled. Te Kooti camped nearby at Mangaorongo, between Kihikihi and Otorohonga. Given his reputation it is likely that many settlers would have felt uneasy about his presence in the district. Te Kooti and his entourage arrived one afternoon at the door of the Hutchinson house, and reportedly demanded food and drink — which Mrs Hutchinson provided. When she was asked by Te Kooti whether she was afraid of him, she said ‘no’, and in response Te Kooti gave her his kaitaka – and advised her that ‘so long as you wear this cloak no Maori will molest you’. The kaitaka was taken to England by Mrs Hutchinson’s sister-in-law in, where it remained until 1954 when the donor, Mrs Peggy Wing, visited relatives and saw the garment herself. It was returned to New Zealand soon after and at Mrs Wing’s request underwent 75 hours of restoration. Judith Binney. Redemption Songs: A Life of Te Kooti Arikirangi Te Turuki. Auckland: Auckland University Press, 1995. Ibid. “Māori Prophetic Movements – Ngā Poropiti – Te Kooti – Ringatū.” Te Ara – the Encyclopedia of New Zealand. Last modified June 25, 2013. http://www.TeAra.govt.nz/en/maori-prophetic-movements-nga-poropiti/page-3. J.G. Graydon. “Te Kooti’s Korowai.” Journal of the Te Awamutu Historical Society 1, no.2 (1966): 43-45. E.C. Hunwick. “Te Kooti Donatcd His Cloak as Protection for European Lady.” Footprints of History 17 (1996): 1-2.